A small heavily restored church, originally C13 with important Tractarian connections. It is close to a C18 house, which is now a school. The church is its chapel. East Lavington church stands close to the big house of 1790, altered in 1903 with wide lawns in front of both. Now a school, Seaford College, it belonged in the C19 to the Wilberforce family. Its most eminent member to own the property was Bishop Samuel Wilberforce of Oxford and later Winchester (1805-73), one of the most celebrated Anglican bishops of his time. From 1833 to 1851 the future Cardinal Henry Manning (1808-92) was rector (1 p66) and his short-lived wife was sister to the bishop’s wife. She is buried in the churchyard, as is the bishop himself. 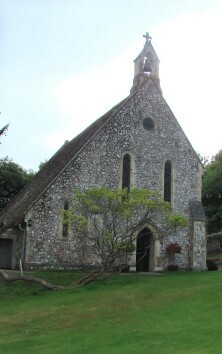 The small church is in effect treated as a feature of the gardens, though it has now lost the large conifer that once concealed much of its west end (vidi). In origin it is mostly C13, though a church is mentioned in Domesday Book (6,4). The two-bay north arcade has an octagonal pier and tall double-chamfered arches of a lighter stone. The square responds with semi-octagonal shafts for the inner order of the arches, are related to those at Bignor, where the shafts, however, are round. 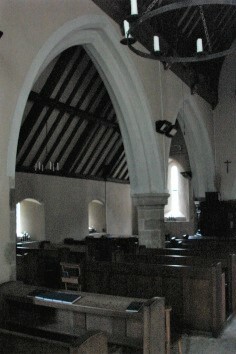 The chancel arch, low in proportion to the nave and chancel, is also built of two different stones, with chamfered responds and semi-octagonal corbels for the inner order of the head. Although the exterior is refaced, the side walls of the chancel are C13, as the old rere-arches of the renewed north lancets show. A chapel projecting from the south nave has no old detail, but it is present in the Sharpe Collection drawing (1804) and its two-light square-headed east window there looks C15, which may be the date of the whole chapel. 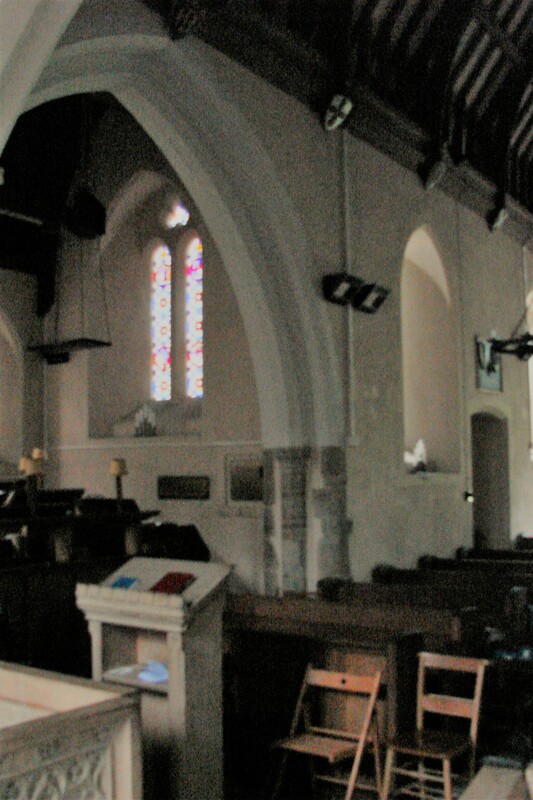 The window in the south chancel is one of the few old features externally, It has two lights and a square head with uncusped lights and dates from the C16; so probably was a similar four-light east window in the Sharpe drawing. The church as it stands today is largely Manning’s work. His choice of architect was J P Harrison (Eccl March 1847 p171), who in 1846-47 lengthened the nave and replacing a shingled spirelet by a stone belfry. He extended the aisle to the new west end with a small arch west of the arcade that resembles those of the arcade. He also replaced most later windows by lancets, including an east triplet. As remodelled, the south chapel has lancets and windows of plate tracery. The elaborate roofs have castellated wallplates with shields in the nave and hammerbeams in the chancel. According to G E Street‘s son, his father restored ‘Woollavington’ (A E Street p304), another name for East Lavington, and it has been assumed, e g by Ian Nairn (BE p215), that this meant East Lavington church. However, though it might seem a reliable source, A E Street’s book about his father contains some egregious errors and in this instance it is likely that Graffham church on the estate (this is often known collectively as Woollavington and Street definitely worked at Graffham), is meant. Both stylistic (e g the roofs) and documentary evidence leave little doubt that Harrison was responsible for East Lavington. Furthermore, Adelaide Tracy (II p17) shows the church as it is now in 1849, very soon after Harrison is stated to have worked there and surely too early for Street. 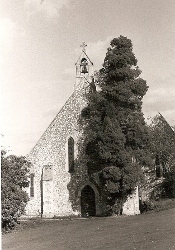 In 1972 the church was declared redundant and it was transferred to the school for use as its chapel. Brass: (South chapel east wall) Inscription in memory of Bishop Wilberforce, 1873. Nearby in a glass case is Wilberforce’s episcopal crozier. Font: Elaborate neo-Norman with figures standing in arches, probably of 1847. 1. Glass of 1844 by T Willement (Willement ledger) in the chapel ‘at Lavington for the Venerable Archdeacon Wilberforce’ (he was then Archdeacon of Surrey) must be that in the south chapel. It consists of a two-light east window with a coat of arms in the quatrefoil, two south lancets (also heraldic) and a two-light west window with subjects in medallions and a coat of arms in the trefoiled head. An east window made for Manning in 1849 by Willement at a cost of £56 13s 0d (ibid) has gone. 2. (West window) H P B Downing, 1918 (www.stainedglassrecords.org retrieved on 11/2/2013). Piscina: (Chancel) Segment-headed and projecting into the adjacent window-splay. Possibly C16 like the south and former east windows. Sedile: The sill of the south chancel window has been lowered, probably when the window was inserted in the C16.